There are many myths around hospice care; once in a hospice you never come out, they’re dark and dingy and full of gloom and doom. Preconceived views are hard to change but we’re determined to prove the myths are far from the truth. Meet Caroline from Par. Caroline had breast cancer five years ago, she’s a survivor and she isn’t dying, but she does need to visit Mount Edgcumbe Hospice once a week. False: You only go to a hospice to die. True: Our specialist care helps many to carry on living a normal life. Meet Caroline. She’s a Train Guard, she isn’t dying, but she does need to visit Mount Edgcumbe Hospice in St Austell once a week. Click here to hear the first part of Caroline’s story. 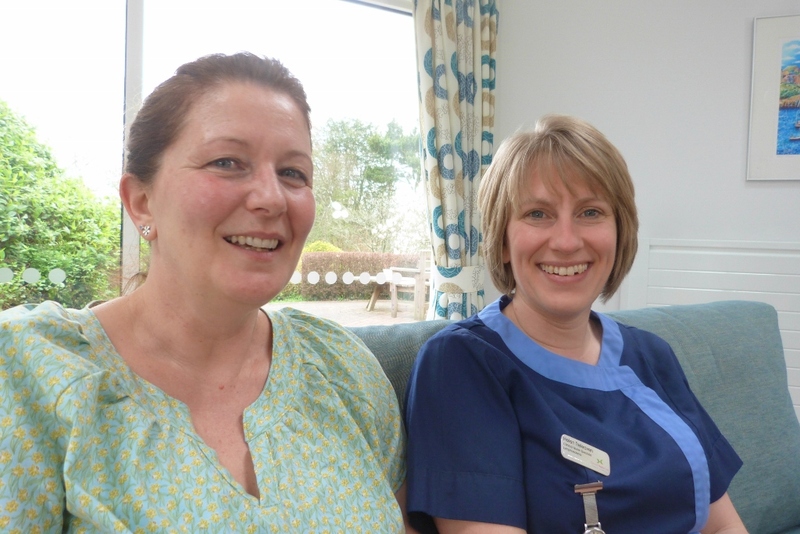 You can find out more about Lymphoedema and the work our specialist nurses do by watching Terri & Helen’s story here. False: Hospice care is for the patients only. True: We very much care about those around you too, whether they are your carer, family or friends and we offer them support as well as looking after you, as Lymphoedema patient Caroline explains. Click here to watch the second part of Caroline’s story. False: Hospices are only for old people. True: At Cornwall Hospice Care we support people from the age of 18. We care for patients like Caroline who want to stay at work, sometimes for terminally ill parents bringing up children and for young people in their late teens. Click here to hear the third part of Caroline’s story. False: Hospice care is just about giving you medicine to make you feel better. True: It’s much more than that. Sometimes we don’t even need to give you medicine, you may just need therapy, and there’s always time to talk as Caroline explains…..
Click here to hear the fourth part of Caroline’s story. False: You only receive care from the hospice teams when you’re an in-patient. True: We care for people in a range of setting, from the hospices, to the acute hospitals and care homes, and now we are reaching in to the community with our new Neighbourhood Hubs, as our Director of Patient Services, Dawn Tame-Battell explains. Click here to watch our Facebook Live interview with Dawn Tame-Battell. False: Hospices are gloomy places that are dark and scary. True: Our two Cornish hospices are light and airy. You’ll often hear laughter and see pets visiting their owners. They are peaceful sanctuaries and are often described as homely. Click here to take a quick look around our hospices for yourself. False: Hospices keep their specialist knowledge to themselves. True: Cornwall Hospice Care is a charity that shares its specialist knowledge, helping to educate the healthcare workers of the future, people like Ellie, a third year medical student who was on a placement at Mount Edgcumbe Hospice back in March 2017. Hear what Ellie has to say about her experiences on her placement.